Why are Escape Rooms so Popular? Stats and figures. A phenomenon that is growing throughout the world is the fascinating world of Escape Rooms. Whether played by teenagers, adults or people in team-building programmes, the Escape Room is a perfect way to test your wits in a race against time. The concept is simple and we’ll describe it for anyone that hasn’t experienced an Escape Room so far: a group of people is locked into a room and has 60 minutes to find the way out. Simple… but not too simple. To escape the room, the group must face the daunting task of solving different puzzles and find different clues that are linked one to the other. By doing this, the group can eventually find the key that will open the door to freedom. If they can’t do it… well, better luck next time. Inspired by the famous “point and click” adventure games from the 80s, the first Real Escape Game (REG) was developed by Japanese Takao Kato in 2008 and it was based in Kyoto. A game creator and an avid manga fan, Kato told the press that he was “wondering why interesting things didn’t happen in my life, like they did in the books, […] I thought I could create my own adventure, a story, and then invite people to be a part of it.” The Escape Room had a single room and could be played by a team consisting of 5 or 6 players. According to S. Nicholson’s study on escape rooms, they involve teamwork, communication, and delegation as well as critical thinking, attention to detail, and lateral thinking. Escape Rooms can be played by a wide age range of players and thriving teams are those that have players with a variety of experiences, skills, background knowledge, and physical abilities. Being live-action games taking place in the material world, Escape Rooms create ways for players to directly connect one with the other. This is something that happens in Board Games, but Escape Rooms bring a whole different experience as players distance themselves from a board with meeples and cards, entering a physical fantasy world where they will find challenges and engagement opportunities. Obviously, being part of what seemed like a computer game became a real hit and the Escape Room concept expanded all over the world. According to MarketWatch statistics, from 2010 and up to this day there are more than 2.800 permanent Escape Rooms worldwide. Furthermore, Escape Rooms prove to be a really good business, as the first one that opened in the Pacific Northwest U.S., had an investment of $7.000 and the gross in 2015 was over $600.000. Another famous Escape Room in Dallas, Escape Expert has monthly revenues of $70,000. 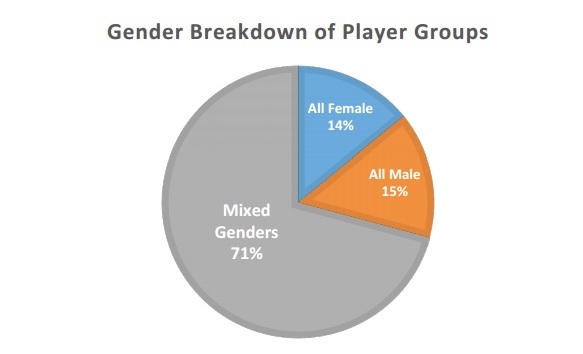 About 37% of groups have players over 21 years old, about 14% of players are families with parents and children, whilst 19% are groups of players aged below 21. From another perspective, 19% of the Escape Room customers are corporate clients whilst 11% of groups are couples out on a date. 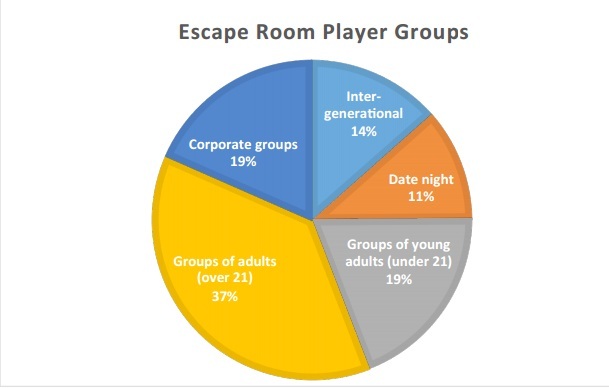 These statistics show that the Escape rooms are more likely to attract groups of young players (about 36% of users) than adults (25%). Another important element concerning the success of an Escape Room is the theme. While some players go to Escape Rooms just to face the challenges of the puzzles, others are more interested in the narrative behind the room. Obviously, the better the theme is reflected in the actual room, the more successful the business is. The themes also differ from one continent to the other. For example, as Scott Nicholson’s study suggests, horror themes are more popular in Asia, where 24% of the rooms have a horror theme. On the other hand, in Europe, customers prefer themes influenced by the last century and in America, players prefer the modern times. With different themes, intriguing challenges and rooms that give you the feeling that you are actually part of a video game, the Escape Rooms are a perfect way to spend an hour with friends, testing your teamwork capabilities, your wit and intuition and last but not least, the amount of fun you can have by playing. Please could you let me know where the stats and figures were found. Would be really helpful for my assignment to have some references.